It's been a great Fall for having Alums visit, and that's been so much FUN! 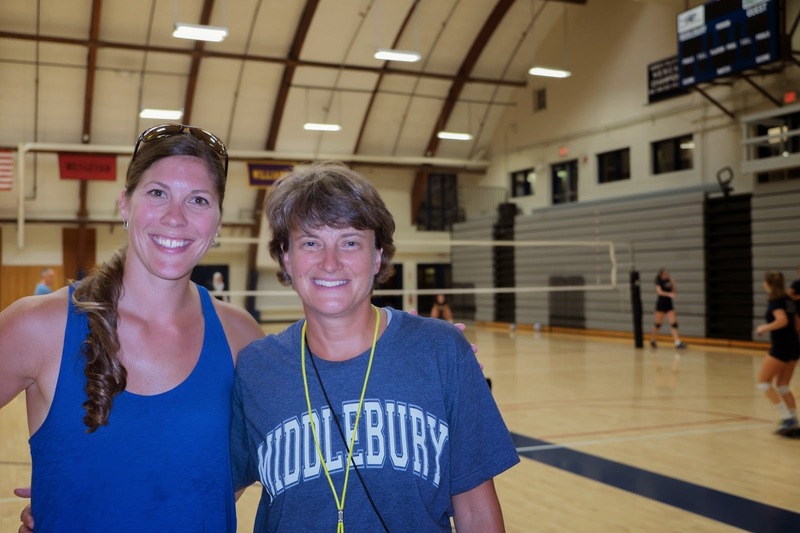 First, Amy Lowell ('01) visited with her friend Charlie, and watched the beginning of practice, and got introduced to the team back during pre season. 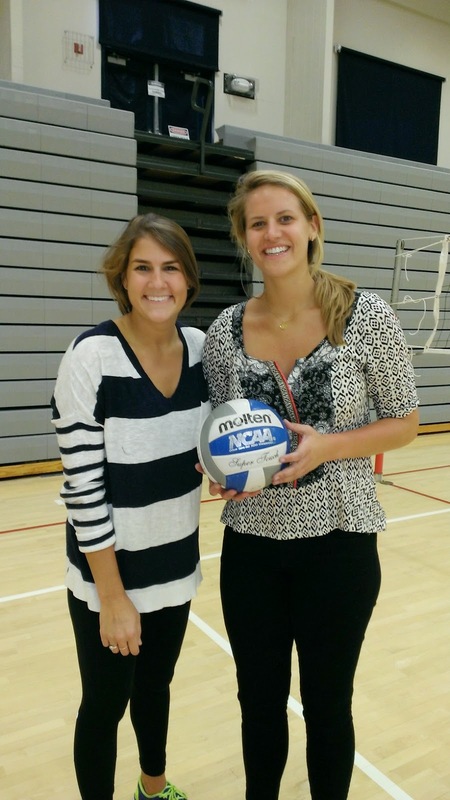 Then, just recently, Jane Handel '12, and Elissa Goeke '12 visited and stayed for most of practice and even ran a ball control drill while Brian and I were working with the blockers on the other court. We also had another surprise visitor from the class of '98. 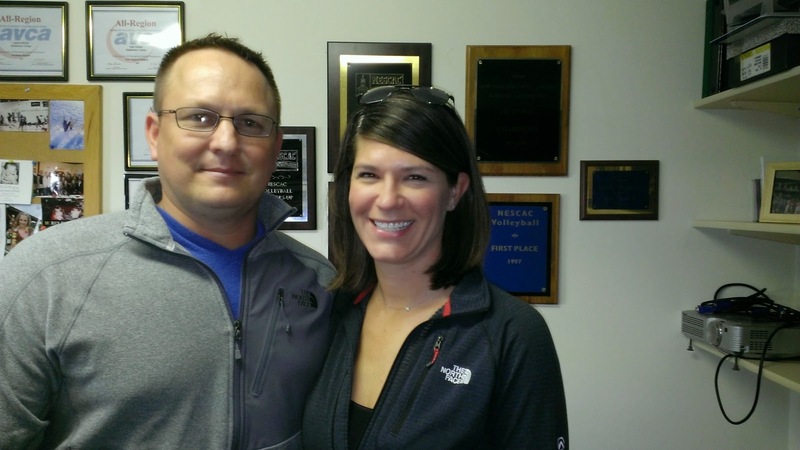 Cathy Veach Moyer '98 stopped by with her husband after being in the Stowe area on business. I looked right at her, and was like, "Hi there! How's it going?" and then realized, wait a minute...Veach?! (I still can't call her anything but Veach, and even introduced her that way--sorry Kevin!) :) It was fun to introduce them all to the team, and have them say a bit about when they were here, and what they're doing now. I'm really hoping to get some alumnae connections set up, or at least a pathway for current players/alums to connect, if possible. Anyway, what fun to have you guys all stop by. 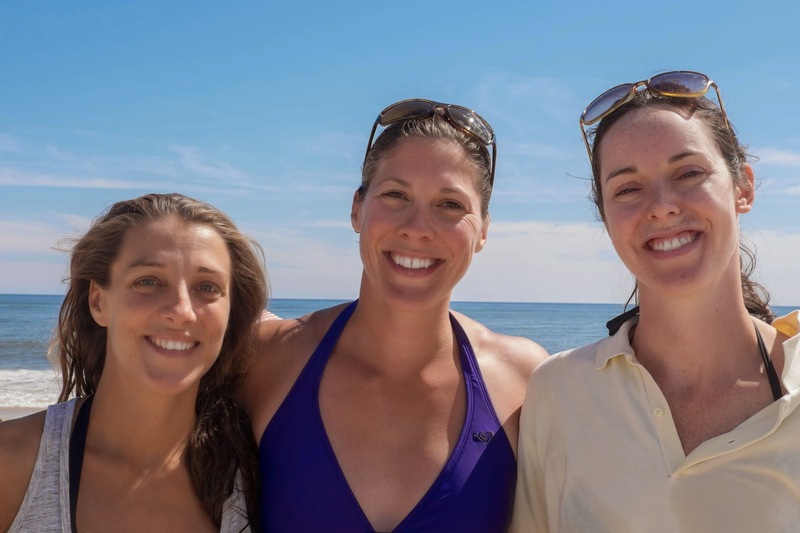 A fun fact about these visitors was that they were all part of one of our four NESCAC Championships! Amy was on both the 97, and 98 teams, and Veach was a senior for our first one in 1997. Jane and Elissa were part of the 2010 Championship. Fun times! If anyone is ever in the area, please stop by to say hello--it's always so great to see you, and catch up, even briefly! Also, Amy sent me this picture of Rachael Faraone '02, Amy Lowell '01, and Leslie Edwards (not sure of her married name--sorry Leslie!) '01 at the beach this past summer in East Hampton. You all look great! Thanks for sharing, and please keep in touch! FYI--I still tell stories about the upperclassmen making you two 6 foot freshmen middles sit in the way back of the vans for our "multiple" trips to Maine back in the day!